Sagging breasts are a most common health issue in women and this occurs due to breastfeeding, menopause, pregnancy, and others. Another reason for sagging breasts is age and when you grow older the breast muscles lose their flexibility and suppleness. Women like their breasts in proper shape and put in all their efforts to be in the best shape. You can find wide arrays of products, creams, and supplements for tightening your breasts. Here are some effective home remedies for sagging breast you can follow yourself at home. There are a number of homemade recipes that can help achieve best results at home. Homemade remedies are the best and natural processes that help to tighten your breasts easily. Add exercise to your daily routine as nothing works better to increase muscle on breasts as well as firms the breasts. Some popular breast boosting exercises are chest press, dumbbell pushup, dumbbell fly, and more. All these exercises are the perfect options to make your breast muscles tighten and help achieve the shape you desire. Ice massage is another effective and natural home remedy to bring firmness to your breasts. For this massage take 2 pieces of ice cubes and then start massaging the breasts in a circular motion for 1 minute. After this wipe your breast and wear a fitting bra. Lie down on the bed for 30 minutes and rest. You can massage using ice on a daily basis. Olive oil massage is also an effective way of getting rid of sagging. Olive oil contains antioxidants and is rich in fatty acids that are completely helpful and tone you’re your breasts immediately. Do this every day for at least 4 to 5 weeks. You can mix olive oil with other carrier oils such as almond oil, jojoba oil and avocado oil for better results that help in the oil getting absorbed by the breast muscles easily. Fenugreek is believed to firm your sagging breasts. It consists of vitamins and antioxidants that are natural and effective to tighten your breasts. Just add one-fourth of fenugreek powder with sufficient amount of water to make a thick paste. Massage on your breast and let it stay up for only 10 minutes and wash it with warm water. Do this remedy once or twice in a week. Aloe Vera is another effective home based remedy for your natural skin and it also helps to tighten your breasts. It is a high source of anti-oxidants is available in aloe vera that prevents sagging breasts. You can apply aloe vera gel on your breasts directly to get firmness to your breast. Do this every week for 4 to 5 times for positive result. Mix one teaspoon of aloe vera gel with one teaspoon of mayonnaise and apply onto your breasts and leave for 15 minutes and wash with warm water and you should do this once in a week. Cucumber and egg yolk is an excellent home remedy to rigid your breast easily. You need cucumber puree from one cucumber with egg yolk and also mix one teaspoon of butter and the make the mixture as a paste. Apply and leave it for 30 minutes next rinse with cold water. This will help to strengthen your breast. Use egg white is the best for sagging breasts. Egg white contains astringent and other skin-nourishing agents that help to nourish your skin. Beat one egg white until it is frothy. Start applying on your breasts and leave for 30 minutes then wash it with cucumber onion juice and finally rinse with normal cold water. You can create another breast mask by adding one egg with one teaspoon of pure yogurt and honey. Apply around your breasts and let it stay for 20 minutes then wash with cold water. Pomegranate is an amazing fruit that works greatly to provide rigidness to your breasts. It contains anti-aging properties that prevent sagging breast muscles. Pomegranate seed oil is a good source of phytonutrients that lead to dense breasts. Take peels of pomegranate and make a paste of it by adding warm mustard oil then massage in circular motion for 10 minutes around your breast to get rid of slacking breasts. Rhassoul clay contains various minerals such as silica, magnesium, iron, calcium, potassium and sodium that help to stiff and constrict sagging skin. Add 2 tablespoons of Rhassoul clay powder with sufficient amounts of water to get a soft paste. Apply this paste onto your breast, let it dry and then wash with lukewarm water. Do this treatment once in a week. Another natural home remedy to firm your sagging breast is shea butter that is rich in vitamin E that helps to stiffen your breast. Massage with shea butter onto your breasts for 10 to 15 minutes and then rinse with normal water. For effective result, you should do this 3 to 4 times in every week. To enhance the effect of the above home based recipes and to get complete firmness in your breast you should perform yoga and several types of yoga are presented that are specially performed to get tight breasts. You must eat healthy foods and always include essential nutrients such as proteins, vitamins, minerals, calcium, and others that help enhance the firmness of the breasts. 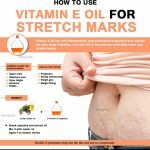 How to Use Vitamin E Oil to Get Rid of Stretch Marks?